You may have noticed a new ad in my sidebar. As a part of the Blogpaws initiatives to help homeless pets, a number of us are participating in an effort to help bring about a time when there are no more homeless pets. Best Friends Animal Society is more than just a friend to animals; they are making a real difference. With Valentine's Day approaching, love is in the air. This is the time of year when we all tend to think of those we care most about. Hopefully homeless animals are on your list. Best Friends Animal Society has many ways that you can help. Visit their site and you can read about their programs. You might even decide to sponsor an animal or treat your human sweetheart to something from their store. In this way, you will be supporting homeless animals at the same time you take care of your Valentine's shopping. Handy, right? Speaking of Valentine's Day, I announced a bracelet giveaway last week and lots of you entered the drawing. 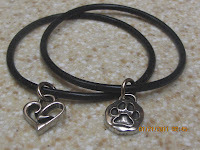 I'm sure the folks at Freaky Dog People will be glad to know you love their bracelets. It's time to announce the winner of that drawing. I stirred and stirred the box of names from all you readers that have entered the rolling drawings. The lucky ladies that win today are Vicki R.B. and Gail (you commented here on the blog). I'll get a message to Vicki, but Gail will need to contact me with a full name and address through my email at LetsAdoptaDogPark@gmail.com, in order to retrieve her prize. First come first serve on the design choice: heart or paw print. Congratulations!